"I found Grandview Chiropractic Center through the referral of a friend. I had a poor experience with a previous chiropractor and was not a big believer in the practice. My 3 year old was battling with chronic constipation and I was looking for a more natural option. After seeing Dr. Barry just one time I knew we made the right choice. The team there is kind and compassionate. Dr. Barry listens to your concerns and talks you through recommendations. With just a couple visits as well as his nutritional advice, my daughter has made consistent improvements. After that I decided to see him for my own aches and again with a few adjustments and his advice I have seen great results. He is fantastic with kids (especially shy ones) and he explains complex topics in an easy to understand way. Carrie is friendly and kind and they always make you feel comfortable. I have recommended him to close friends and would continue to do so to others." "I began treatment in May 2018 after an injury and surgery to my left knee. The results of my surgery were not ideal, so after talking with Dr. Barry about the laser option, I decided to give it a try. I have much less pain and my range of motion improves dramatically now after each treatment. I teach dance and I am very active so this is critical for my life style. I am very pleased with my progress." "Harlowe was having problems with her body. She would often fall over and injure herself. After a treatment from Dr. Barry she felt and walked like a million bucks!!" "With treatment for my headaches, I have been able to get back to enjoying the things I did before my auto accident. With continued chiropractic care every 2 weeks, it seems to give better stability to my headaches. I enjoy and highly recommend Grandview because the staff are excellent and welcoming... it's nice to go somewhere and not feel like a number and be greeted by your name instead." "I have always found Dr. Radandt to be very helpful. He is caring and listens well!" "I have been a patient of Grandview Chiropractic for years. Dr. Radandt recommended MLS Laser to me and I researched it. I think it is helping with my knee pain and am pleased with the results so far. I hope it will last after the treatment. I have referred several people and given them the literature to review." "Back pain is what brought me into Grandview Chiropractic. They have helped me and I will recommend it to others!" "About 8 years ago, I visited Dr. Radandt for chronic neck and back pain. I began to notice a change within a few months. My ability to use my shoulder and arms more freely along with decreased pain and tension in my neck, gave me more freedom and flexibility to do more in my life." "Over the last 6 years taking nutritional supplements recommended by Dr. Radandt has replaced prescription drugs for sinus infections, muscle and nerve spasms, IBS and arthritis. These supplements have actually reversed much of the joint pain and stiffness in my hands. Supplements have also improved bone and gum health in my mouth. I now feel more energetic, more mobility and much healthier than I did 10-15 years ago." "After surgery, chemo, and radiation, I learned about healthy eating and anti-inflammatory foods. Still feeling sluggish and wanting to do everything possible to prevent a recurrence, a friend suggested I try Dr. Barry and Standard Process supplements. I was skeptical but decided to try it and mentally told myself I would need to definitely feel a difference to continue the regimen. That was over 2 years ago. Dr. Barry's continued monitoring and suggestions have increased my energy levels and focus. By working together, my future looks just the way i hoped it would." "A year ago I could barely get through a day. I could get done what I absolutely had to get done and nothing more. I was taking sleeping pills, anti-depressants, and medication for fibromyalgia. I was exhausted, but felt like I was on speed! My fibromyalgia was worse than ever. My regular physician wanted to keep treating me for depression, although the only thing I was depressed about was my health and sleep issues. I loved how much time Dr. Radandt spent with me trying to treat my health issues from a holistic approach, specifically, with nutrition. He went after the causes of my symptoms (some of which I have had for over 20 years!) and not just camouflaging my symptoms. Within six months of taking whole food supplements, I had eliminated sleeping pills and the fibromyalgia medication. I feel better than I have in years and all without the need to be on prescription drugs." "When I first went to Dr. Radandt, I had just received my blood work results showing elevated numbers in some areas that if left untreated, could cause some major issues down the road (including diabetes). Dr. Radandt reviewed my information and found some issues that needed to be addressed with proper nutrition. Over two years later, I have lost more than 30 pounds and any symptoms of health issues are gone! My blood work results from the last two years have all showed excellent numbers and much better health. I highly recommend Dr. Radandt for his excellence in nutrition and his caring about each person individually with the end goal to have the healthiest patient possible!" 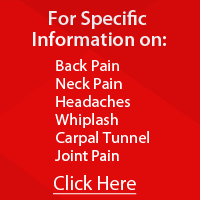 "I originally was treated by Dr. Radandt for neck pain and vertigo issues. During my treatment sessions, Dr. Radandt helped me to understand that our bodies need nutritional support. I completed a Systems Survey Form so Dr. Radandt could focus on specific areas that needed to be addressed in order to improve my overall health. One of the areas I had already brought to his attention was the fact that I had acid reflux issues for more than 20 years! Dr. Radandt recommended specific nutritional supplements and gave detailed explanations as to why each one was needed. I was very skeptical at first as I never expected that there was a drug-free solution to some of the problems I was having, like the acid reflux, cold extremities, watery eyes, and sleeping problems. Since I have been taking the supplements from Standard Process on a regular basis, these problems are no longer a concern. My health is great and I am not on any medications. My entire family now utilizes Dr. Radandt's services and they, too, have experienced dramatic improvements in their health. Dr. Radandt has truly been a blessing to my family and friends!"